– schienale e braccioli che sembrano nati dall’impronta avvolgente di tre morbidi petali – con la geometrica varietà delle strutture di sostegno. The Helsinki collection, designed by Caronni and Bonanomi more than twenty years ago, with its rigorous form, essential beauty, ease of inclusion in interiors and absolute practicality continues to epitomise the soul of the company. 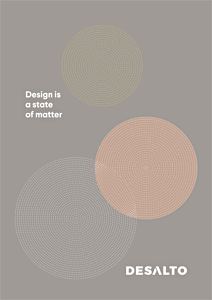 It is the first tool, conceived under the art direction of Gordon Guillaumier who, while maintaining a stylistic and language coherence with the current general catalogue, winks at a more technical interpretation of the product, where details become an integral part of a story that speaks of research, shapes and maniacal attention to particular. 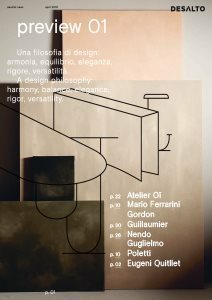 The catalogue of transformation, a new interpretation of design as state of matter and its manifestation, but also as a union trait of a communication path where nothing is lost but simply transforms. 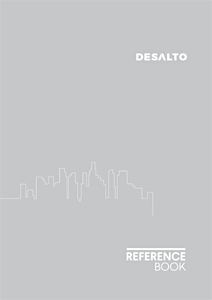 A collection of the most significant works with Desalto products to witness the strong vocation of the company towards the world of contract, to which it responds on a timely basis even with bespoke proposals.